Thomas Harold Oldershaw was the son of the late Arthur and Leeba Oldershaw. He was a pupil and student at George Heriot’s School from 1910 – 1916, and was much liked by all who knew him. He was posted missing in April 1918, and nothing definite was known as to his fate until January 1919, when the German Red Cross sent word that he died on 14th April 1918, and was buried at Moyenneville. 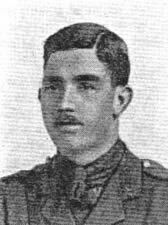 He died at the age of 20 and his name is on the WW1 St Michael’s memorial.